Scrub and dry potatoes, then prick several times with a fork and place on a microwave-safe plate. Heat in microwave on high until tender, 18 to 20 minutes; remove and allow to cool for 10 minutes. Combine Neufchatel cheese and milk in a small bowl; beat in salad dressing mix. Cut potatoes in half lengthwise; remove pulp, leaving a thin potato skin shell. Mix pulp into cheese mixture and mash. 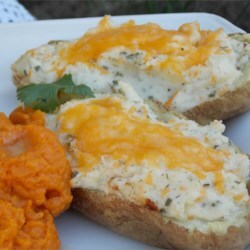 Spoon mixture into potato shells; sprinkle with Cheddar cheese. Place two potatoes on a microwave-safe plate. Heat in microwave on high until heated through and cheese is melted, 3 1/2 to 4 1/2 minutes.